The Ford Ranger Raptor will cost in excess of $75,000 when it goes on sale mid-year, making it the most expensive ute in its class — for now. Picture: Supplied. AUSTRALIA'S love affair with utes is about to hit a new pricing threshold. Ford has confirmed the new Ranger Raptor pick-up will cost from $75,000 when it goes on sale mid-year, making it the most expensive ute in its class. For now. Australia’s appetite for utes has prompted the arrival of performance editions such as the Ford Ranger Raptor. Picture: Supplied. It comes as the Mercedes-Benz of utes went on sale this week with a price that tops out at $65,000 - and there are more expensive rivals on the way. A Holden Special Vehicles version of the Colorado called the SportsCat starts at $60,000 but can nudge in excess of $75,000 once options are added. The HSV Colorado SportsCat+ will begin arriving in dealerships from next month. Picture: Supplied. The Mercedes ute is expected to top $85,000 when the turbo diesel V6 arrives mid year and Volkswagen is said to be planning more grunt and a $70,000-plus price tag for an updated version of its turbo diesel V6 Amarok later this year. Our appetite for mega-utes is so strong that Holden will soon begin selling the "full size" US pick-up, the Chevrolet Silverado, priced between $115,000 and $145,000. It follows the introduction of factory-backed imports of the similarly sized Dodge Ram two years ago priced about $145,000. 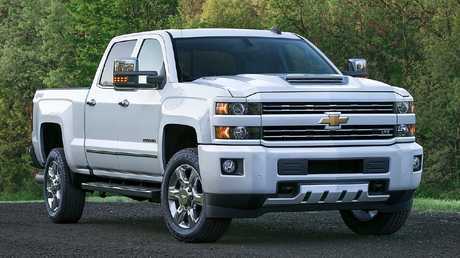 HSV is bringing the Chevrolet Silverado to Australia. It will be sold through selected Holden dealerships. Picture: Supplied. These giants of the ute world are arriving in local showrooms as the Toyota HiLux continues to dominate the new-car sales race for the third year in a row. Last month, utes filled four of the Top 10 sales spots. Significantly, more than half of all HiLux and Ranger utes sold are of the most expensive versions that cost in excess of $50,000. The Ranger Raptor and HSV Colorado are inspired by "desert-racer" style pick-ups that are popular in the US and distinguished by their tougher looks, beefed up suspension and off-road tyres. 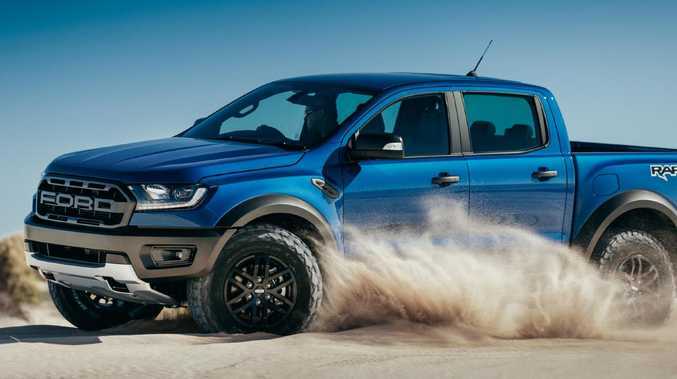 "Aussies have a passion for performance cars, and an appetite for pick-ups, and the Ranger is a direct response to that," Ford Australia President and CEO, Graeme Whickman, said in a media statement. The Ford Ranger Raptor and HSV Colorado are both made in Thailand - as with most utes in this class - but were developed and torture-tested on local roads by Aussie engineers. 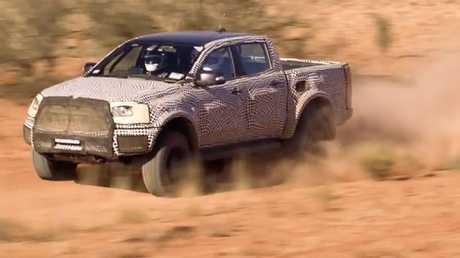 The Ford Ranger Raptor ute wearing camouflage during testing in the Australian outback in July 2017. Picture: Supplied. "Our local design and engineering team has worked incredibly hard with Ford Performance on this truly unique program to deliver a product that brings Raptor DNA and meets the needs of Australians who've called for such a vehicle," said Mr Whickman. 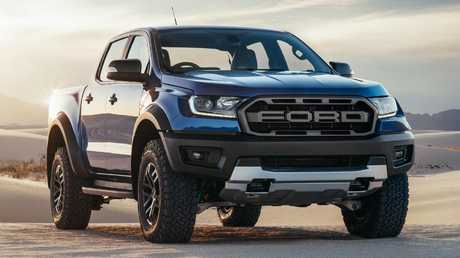 The Ford Ranger Raptor has a 2.0-litre twin turbo diesel four-cylinder engine matched to a 10-speed auto and has a maximum towing capacity of 2500kg. The HSV Colorado SportsCat is powered by a 2.8-litre turbo diesel four-cylinder matched to either a six-speed manual or six-speed auto and has a maximum towing capacity of 3500kg. The Ford has slightly more power than the HSV (157kW versus 147kW) but both have the same maximum torque output: 500Nm. 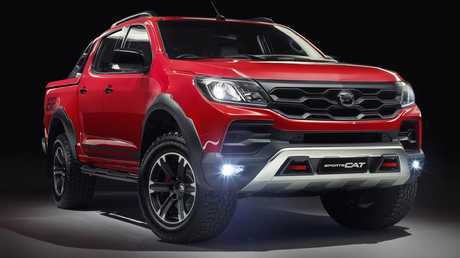 The new generation of super expensive utes will begin arriving en-masse in local showrooms from the middle of the year.